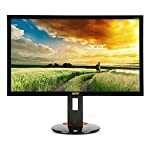 The Acer Predator XB271HK is a premium gaming monitor and whilst it is not cheap it does come with a full range of game ready functionality to enure you get a top quality game experience. For a start, this is a 4k screen. If you’ve splashed out on a PC that has the power to deliver 60fps at 4k then you probably won’t mind spending the money on this monitor. It uses Nvidia’s G-Sync adaptive sync technology to deliver smooth tear free images onto an IPS based screen. The Predator range is Acer’s gaming line and you know that they have built this with gamers in mind. It ain’t cheap though! 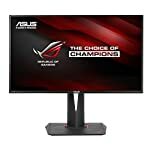 This monitor lines up alongside the ROG Swift PG27AQ from Asus in terms of comparable functionality. You can tell this is a gaming monitor, it has the requisite go faster red stripes. I’m not sure why companies like Acer are keen to ensure their products are best suited to teenage bedrooms but actually the Predator doesn’t look too bad. I think I could live with one in my home office! I guess it does look kinda cool and at least it doesn’t come across as being cheap. More importantly, the design uses a slick solid metal base that is more becoming of a premium product. You don’t want to spend this kind of money to end up with a flimsy plastic stand. The stand has a small footprint so it won’t be taking up your precious desk space. It supports the full range of height, pivot, swivel adjustments which one would hope. The super slim bezels are also appreciated. Overall an impressive look even if gamer red is not to everyone’s taste. Acer have improved the menu system versus the previous models, so if this let you down in the past the enhancement will be a welcome addition. With all the different options and configurations these top end screens need an appropriate interface. You can also now use G-Sync with HDMI as well as DisplayPort sockets thanks to the new 2.0 standard. With a 10-bit IPS panel and a 4ms response time the XB271HK will give you great image quality with the performance gamers want. The image is bright, crisp and colourful and the IPS panel delivers decent colour accuracy that doesn’t degenerate the moment you move your head slightly to one side! G-Sync delivers as expected, switch this on you’ll witness a smoother tear free image that will help fast paced action games to shine through. You will need a compatible Nvidia card, any of the new batch will be fine and if you want good frame rates at 4K you’ll be needing a modern top end GPU anyway. But do remember this display is limited to only 60hz and personally I do appreciate a higher refresh rate when available. But, for the time being, 4k displays are going to be limited by hardware anyway – I’m not sure most gaming rigs could pump out 144 4k frames per second! If you are reading this in the future, then hopefully 4k will be more standard but then there will be a whole range of monitors to chose from by then. We give the Acer Predator XB271HK a 4.5 out of 5 rating. Want to know what existing owners of the monitor think? You can read real user reviews here. 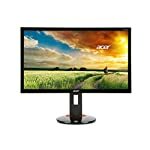 Should I buy the Acer Predator XB271HK? 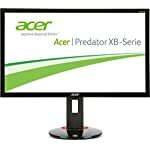 This is a premium 27" 4k monitor that forms part of Acer's game orientated Predator range. It's not cheap but it has everything you might expect from a premium gaming monitor. High resolution, excellent image quality and G-Sync. If you are having some doubts about this purchase then why not read some real owner reviews and see what other buyers think. Welcome to the Acer Predator XB271HK FAQ. This section attempts to answer common questions you may have, please get in touch if you have any more queries or if you think our answers need updating. 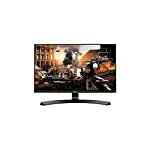 Can I play games at 1440p? Yes, you can run monitors at lower resolutions, the output might not look as good as a native 1440p however. You are still limited to 60hz though. Could I run my PlayStation through the HDMI? You can have a console on HDMI and your PC on DisplayPort and use the menu to switch between them. Happy days. Of course the console won’t be running at 4k!